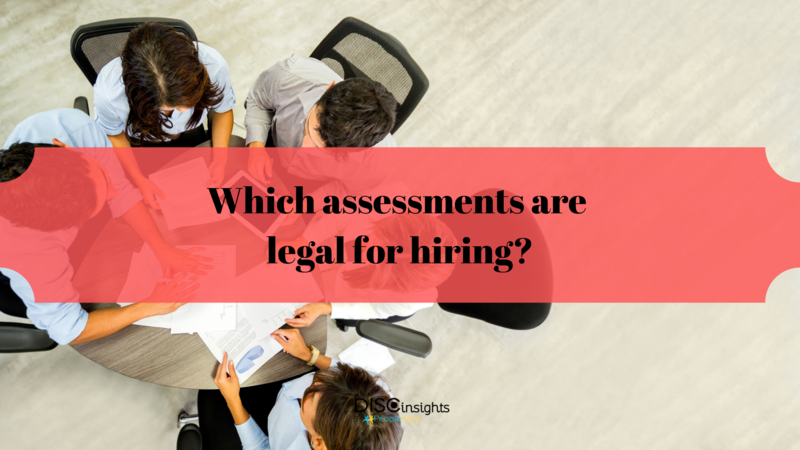 Which assessments are legal for hiring? Employers are saving both time and money by implementing tools for predictive hiring into their regular hiring practices, and to get past the obstacles met within the initial screening of candidates, hiring managers have begun applying a number of pre-hire assessments into final decision-making. These assessments serve as indicators of what a person may or may not bring to the table, how they will interact with an existing workforce and how they will perform in particular environments. According to FindLaw.com, “Forty percent of Fortune 100 companies indicated that their employment selection systems included some form of psychological testing. A similar survey by the American Management Association showed that forty-four percent of its responding members used testing to select employees. While cognitive ability tests continue to be the most commonly used form of psychological testing in the workplace, personality tests are being used more and more frequently.” But, how do you know which assessments are actually compliant and legal for hiring? Three of the most common personality assessments used by hiring professionals include the Myers-Briggs Type Indicator (MBTI), the Minnesota Multiphasic Personality Inventory (MMPI) and the DISC assessment. Let’s dig into the differences and legality for hiring of each. Please, note that there are many lawsuits in the works and currently pending for both the Minnesota Multiphasic Personality Inventory and the Myers-Briggs Type Indicator at this time. The truth is that MMPI and the MBTI aren’t always indicative of how someone handles themselves at work or how well they get the job done. They don’t always indicate a person’s traits when dealing with other personality types, their temperaments or the dispositions faced, based on their tendencies within a group setting, alone or when working with a difficult client. Because neither of them necessarily aligns with the EEOC's Uniform Guidelines on Employee Selection Procedures, and MMPI is considered a medical test and is not legal for a normal hiring process at all, there is always that chance that a rejected candidate will sue, based on discriminatory statutes and bias. Unlike the Myers-Briggs, DISC results highlight the strengths of each person, as a result of change and will predict how they react to stressful situations. The DISC assessment is an excellent tool for use within the predictive hiring process. Unlike the other two assessments, the results are both consistent and are not discriminative for the potential candidate, as more consideration is given to the positioning of environment that would otherwise be dismissed. DISC theory was born through the research of William Marston, a professor and psychologist at the prestigious Harvard Business School. Marston’s outlook on personality assessment was that “one’s normal emotions leads to behavioral differences, and that each person’s behavior might change over time.” He observed people would change their behavior based on the situations they face and environments that they were in, while concluding that while everyone is different, they are predictively different. The bottom line is that DISC is the only real legal choice in the pre-screening of candidates during the predictive hiring process. DISC theory allows proper grouping of individuals with different personality types in teams, whereas it is understood that certain qualities in one personality type will bring out the best in others, allowing collaboration to then thrive. DISC also allows for the hiring of individuals that work better more independently than they do within groups. DISC also provides tools to each person to understand not only their strengths, but also their limitations. Self-awareness is the first step to overcoming these limitations, establishing a way for compensating certain deficiencies and unlocking other ways of achieving success. DISC continues to be helpful once the hire is made during onboarding and teambuilding, and supports the development of skills to improve sales and customer services performance, leadership, retention and boost employee morale as a whole. Contact PeopleKeys to learn more about how to implement DISC for a legally safe and effective predictive hiring process.